Google Maps is a much more complete, more polished product offering, but that's mostly because Google Maps has been around for years. Its developers have had plenty of time to refine it -- but its users have helped a considerable amount as well. Every Google Maps page has "report a problem" located somewhere on it, allowing the company to crowdsource and verify much of its data. Like Google Maps, Apple also allows users to submit error reports and correct POI data. Last week, Apple said that "the more people use [Maps], the better it will get." Reporting errors in information is surely part of how Apple plans to improve the product. 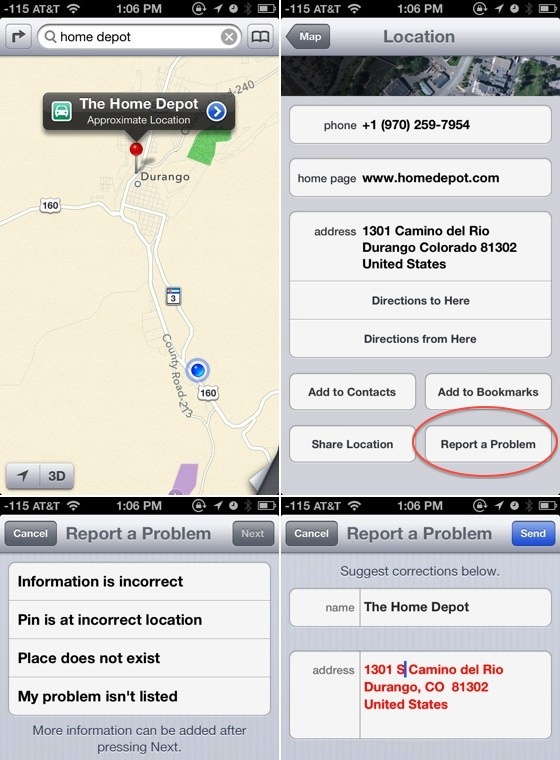 The Home Depot in Durango, Colorado is located at 1301 South Camino del Rio, but, Apple's map data puts it at 1301 Camino del Rio, in the middle of downtown Durango. It's unclear how quickly the data will be integrated into Maps, nor what sort of quality control processes the company has in place to deal with malicious submissions. there's only one nice thing about apple making its own maps - COMPETITION! because now google and apple will be competing with maps on mobile devices, this will drive the companies to consistently make better map apps for the consumers. Why is such a terrible font used on the map as well? Its Avenir, and its an absolutely lovely typeface. In 2010, when Google was suffering similar, though not as widespread problems, they were receiving 10,000 user submitted corrections a day; just over 3.5 million a year. Maps has been in the wild for less than a week. Is there a "The entire app is incorrect" option? Competition only works when customers are able to switch without friction between different products. The current situation is about as non-competitive as can possibly be. These will be the majority of responses. Just yesterday I reported the fact that the Lincoln, Nebraska airport actually, um, existed. Seriously, though, I think this map thing will be like how "Flash on the iPhone" went. Annoying the 1st year, better the 2nd, and by the 3rd year only nerds will still be complaining about it while everyone else is just fine.